Today I spent the day cooking, camera in hand, notebook filling with my scribbles as I progressed from one recipe creation to another. A slow Sunday - well, my Sunday, anyway because it's actually Monday to everyone else - and it's been a happy Sunday where I can do what I want at my own pace wishing I had the entire week to work like this. Starbuck and I ended the afternoon with a bay front walk to take in the sun before it disappeared into the Pacific Ocean. In the old days, when I was still allotted five weeks of vacation time (a company 'thank you' earned at the 20 year mark), I'd take two weeks off every January because the weather in San Diego is generally nice and all visiting family throughout the county have just about cleared out and the city is finally returned to us natives again. At least until spring break. Being a weekday and nearly 4pm with only an hour and half of daylight left when we got to the bay, I was surprised to see so many people there. The benches dotting the outskirts of the playgrounds were filled with chatting moms while the slides and swing sets were filled with happy toddlers. As we meandered along the boardwalk, families of three and four on bikes ringing their bells passed us, as did joggers, roller bladers and speed walkers. Even kayakers on the bay and a couple of rowing teams being held to cadence by coaches were among the sites and sounds. Ah, January. I can't believe we are halfway through you already. The Christmas tree, which we keep up and decorated at least through the Epiphany - January 6th, the twelfth day of Christmas - was masacured Friday. Grams, not realizing that the city's recycling program is still underway, took to the tree with her pruning sheers. What stands in it's place now is a trunk with a few scraggly twigs poking every which way at the very top. It kinda looks like a Charlie Brown Christmas tree now. There area a few decorations still out and some lights still in need of being taken down and then we'll officially say goodbye to Christmas 2013, freeing us to concentrate on January - the official fresh start. I'm not one for new year resolutions. This ritual of making grandiose promises to yourself only to feel like a failure come December because you only succeeded in keeping one – if any – is harsh and unkind. I think there is enough unkindness in the world as it is. Why add to it? Especially when it's aimed right back at you? A running list of smaller, realistically attainable goals throughout the year is what I prefer for myself. For example, instead of saying, "This year I resolve to lose fill in the blank pounds," I say, "I would love to incorporate more fruits and veggies in my meals during the week and save the heartier, yet healthier, fare for the weekend when I'm more active." Instead of, "I'm getting up at 6:30 a.m. everyday to exercise before work," I say "I need to get Starbuck out for more longs walks this month." Seriously, I think it's more doable to look at it this way. I'm not overwhelmed by grandiose, blanket statements. Breaking them down into smaller, more specific goals is so much easier for me. I feel it's better to go from zero to something and keep the momentum moving forward than to go from zero to nothing and hate myself for it. Once I reached my 40s, I realized the amount of time and energy I was wasting fooling myself was absurd. I know myself well enough finally to recognize that big new year resolutions are simply counterproductive for me. When it comes to my life goals overall, of course I do still dream; I do still plan. Everyday, I'm taking the steps necessary to keep moving towards them. The difference now is that I do it in a kinder, gentler way. I need time to ponder, to soak everything up, to create new, healthier habits, to enjoy the accomplishments and any milestones along the journey. It's human nature that when there is quantifiable progress, our excitement spurs our interest and keeps us working towards the bigger goal. So slow and steady is my way of being able to see and chart the progress - and adjust course as needed - revising goals and dreams as I make new discoveries about myself along the way. Now I'm not saying DON'T make grandiose plans if that's your bag. Who knows? You might be the kind of person that needs the big, grand plans. And you know what? That's OK if you need that fire under your heels to get you off and running. Just don't judge me because I'm a walker and you're a sprinter. So sprint away, dear friend. I'll cheer you on and see you in December with love and kindness regardless of how many resolutions you kept. Love and kindness. So much better than harsh and unkind. 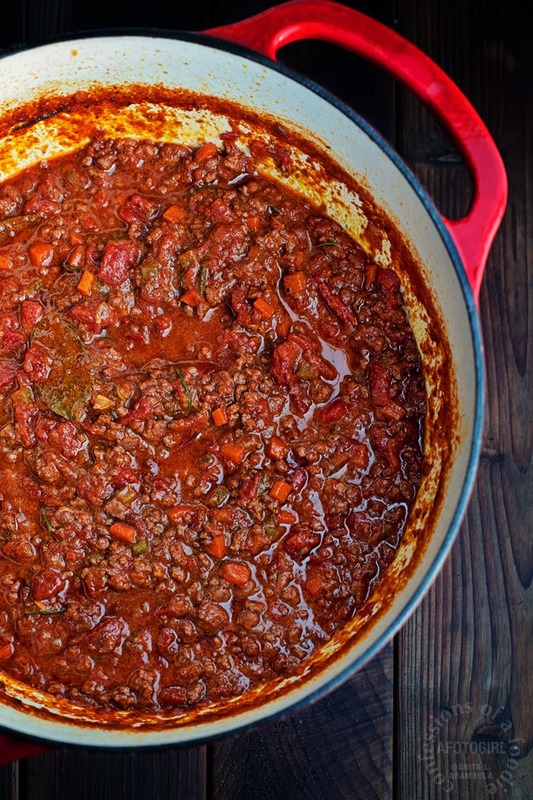 I've seen a few posts over the years on ragù and I've been meaning to get one under my belt for nearly as long. 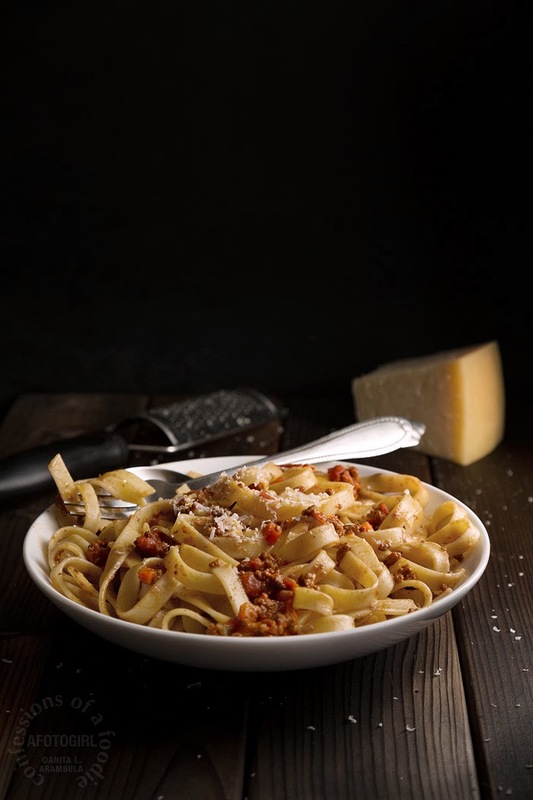 Ragù is a meat based sauce that is slow cooked all day so the sauce has time to develop it's rich, bold flavors. 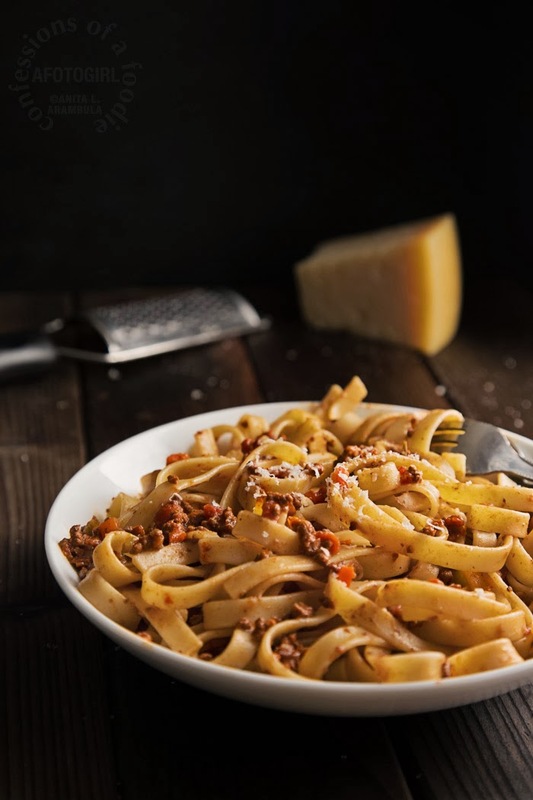 Traditionally, there's a variety of meat in the sauce and can include any combination of beef, pork, chicken, lamb, duck, mutton, veal, and even game. But what if you don't have that kind of time? What if you want something that is still delicious and takes all of about an hour? Naturally, this version isn't going to taste quite like one that has had a full day on a low flame but I think it's nonetheless one of the most satisfying good eats. The secret is using a trusted brand of store-bought beef stock (stock not broth), good quality Italian canned tomatoes (I used Pomi) and a good Italian tomato paste from a tube (I use Amore). 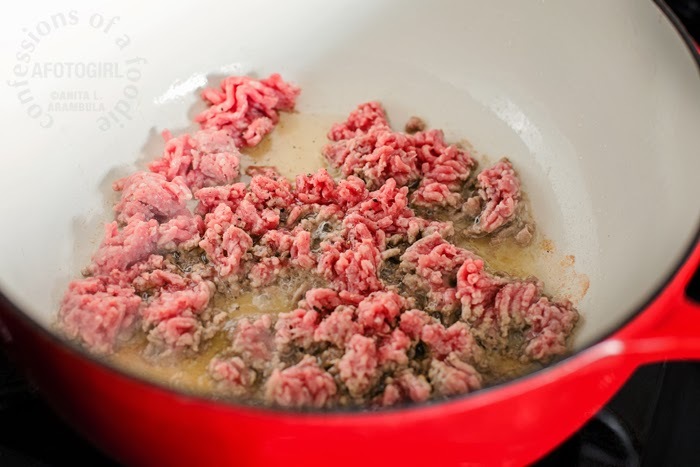 Since I splurged on grass-feed ground beef, I choose not to add other meat so that the beef would be the highlight. 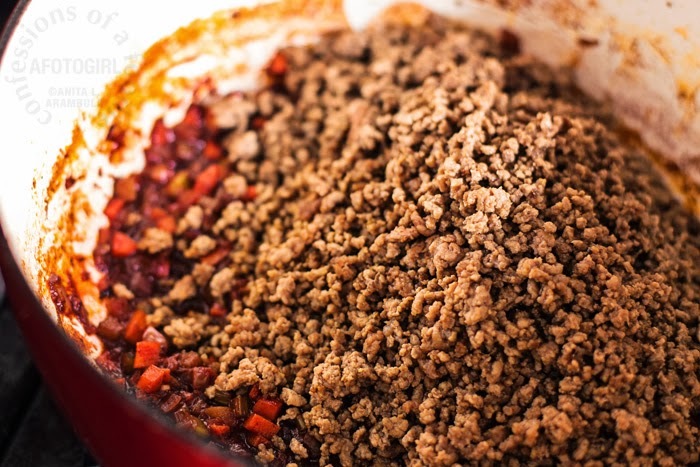 Feel free to add a little ground pork or even a link of hot Italian sausage if you want to add a little extra heat. 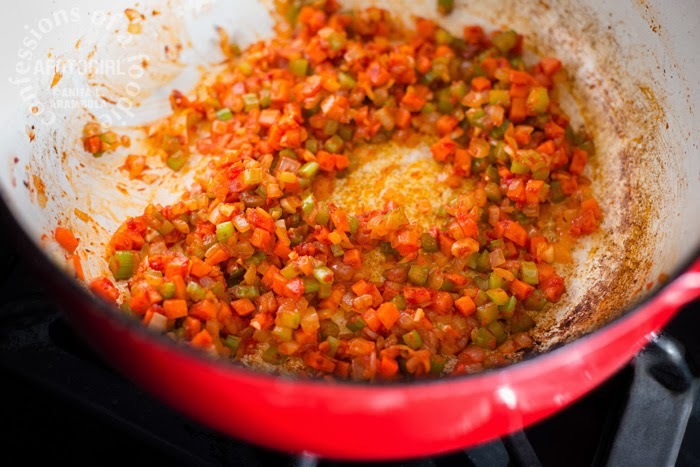 As for the prep, I am being particular about the size of the diced vegetables because this is a relatively quick cook and we need even-sized small pieces that will cook quickly but still infuse the sauce with their flavor. 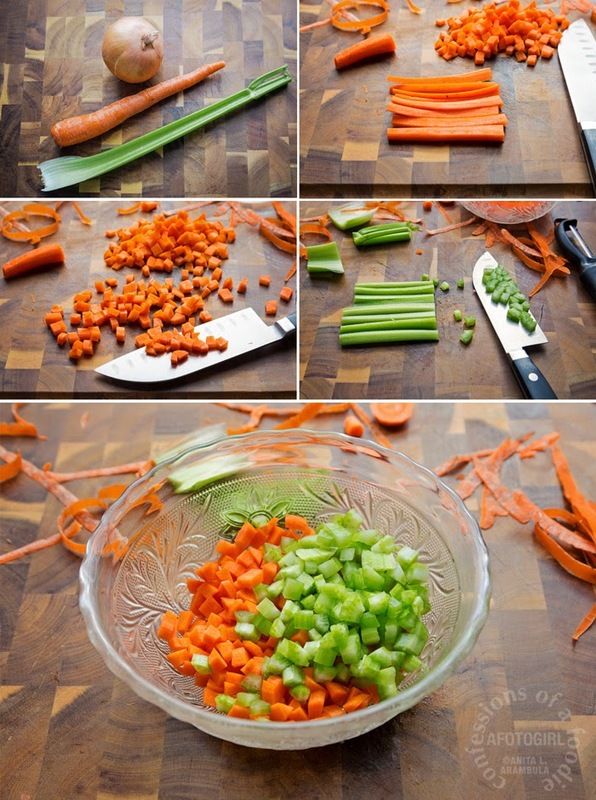 Prepare the vegetables: Cut carrot into three equal pieces; slice each piece in half lengthwise then slice each half into ¼" matchsticks (see the first collage of veggie photos above). Line up the matchsticks and cut across to chop into a ¼" dice. Repeat with celery ribs. 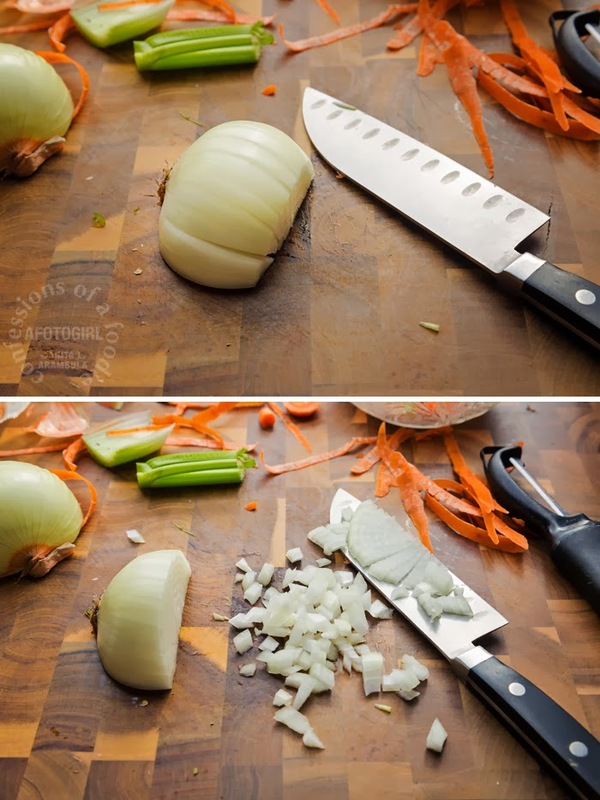 Dice onions by cutting ¼" slits into the onion leaving the root side in tact. Slice across the onion at ¼' intervals to create an even ¼" dice. Finely chop the garlic. Set vegetables aside. Divide the beef into thirds. Heat a dutch oven or other heavy bottomed stock pot on medium heat. Drizzle 1 tablespoon of olive oil into the pot. Once the olive oil has started to shimmer, crumble ⅓ of the meat into the pot; continue breaking up the meat using a wooden spoon. Sprinkle a pinch each of sea salt and freshly ground pepper over the meat; stir occasionally to keep the meat cooking evenly. 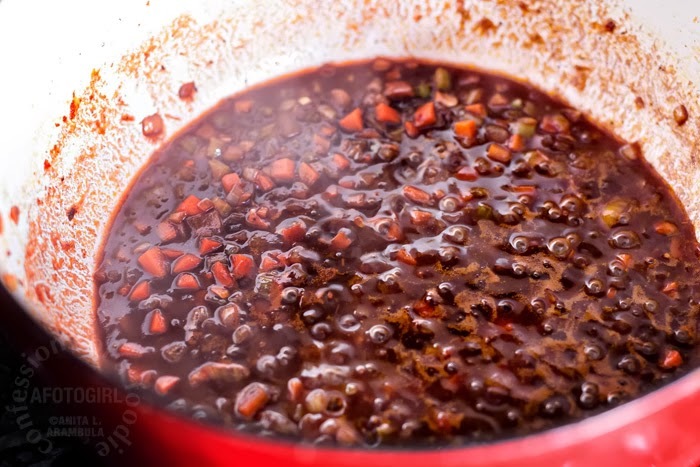 After about five minutes, drain any excess moisture and grease from the pot leaving only about a teaspoon of it behind. This will allow the meat to brown and not stew. Once the meat has browned, use a slotted spoon to remove the meat to a holding dish. 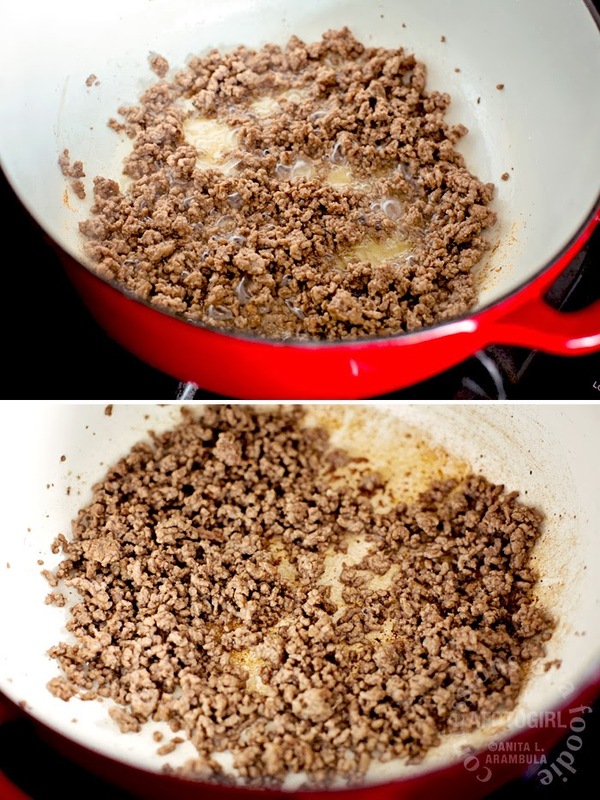 Remove excess grease from the pot leaving 1 tablespoon worth and repeat the process with the remainder of the meat. Once all the meat has been browned and removed from the pot, toss out the meat grease left in the pot but do not rinse or wipe out the browned bits left behind. These will add flavor when the pot is deglazed later. Return the pot to the heat and add 1 tablespoon of olive oil. Toss in the onions and sweat for a few minutes until the onions are translucent but not browned. Stir in the carrots and celery and cook for 3 minutes, stirring continuously. Add the garlic and continue to sauté for an additional 2 minutes. 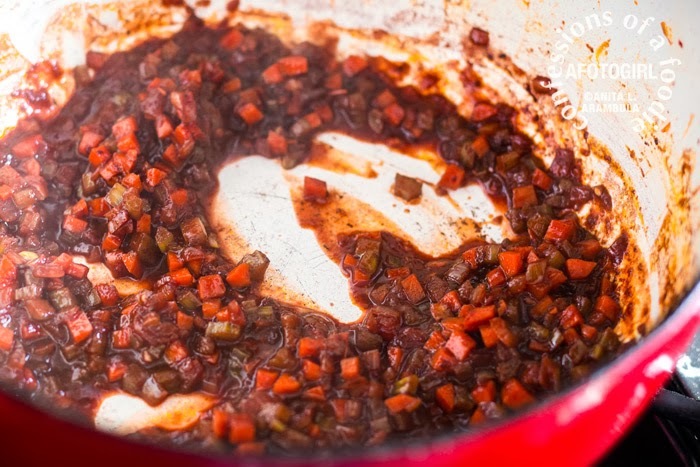 Squeeze about 4 tablespoons of tomato paste into pot and incorporate into the vegetables. Carefully add the wine and use a wooden spoon or rubber spatula to mix well, scraping up all the brown bits on bottom of the pot. 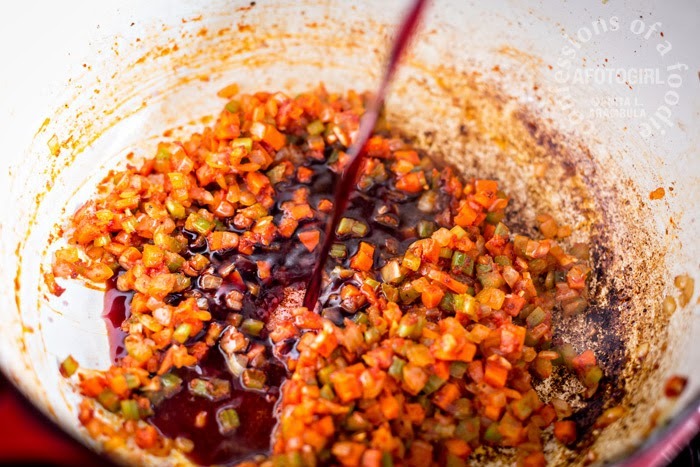 Allow wine to simmer and reduce by half, about 8 to 10 minutes, stirring occasionally. Return beef to the pot and stir to combine. 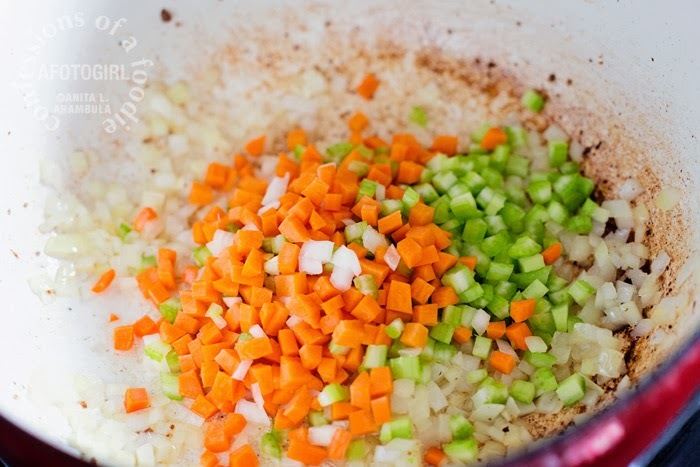 Pour in the stock briskly stirring to incorporate. Drop in the bay leaf, rosemary and oregano (I went lazy and left the herbs whole, fishing them out before serving; you can take the time to de-stem if you like or bundle them into a cheesecloth to make it easier to remove). Cook on medium heat, stirring occasionally, until the sauce has thickened and reduced by at least ⅓, about 25 to 30 minutes. Add the cream, stirring well to incorporate. Continue simmering until the pasta is ready. 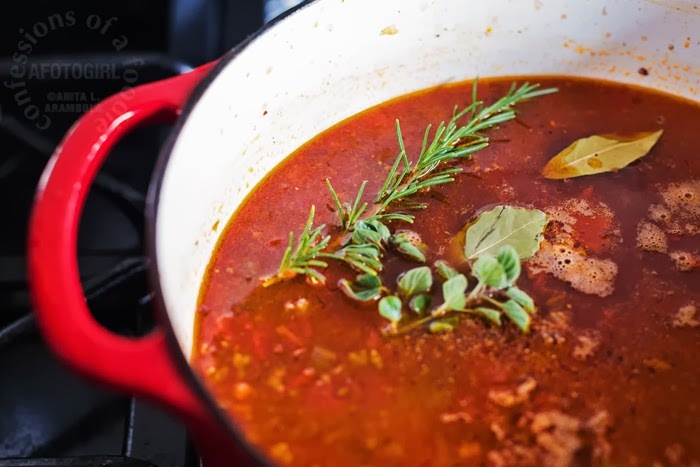 Cook the pasta: While the meat is simmering, heat a large stock pot filled with water until boiling. Add a tablespoon of salt and carefully drop in the pasta. Cook pasta, stirring frequently until the pasta is al dente, about 10 to 12 minutes or according to package directions. 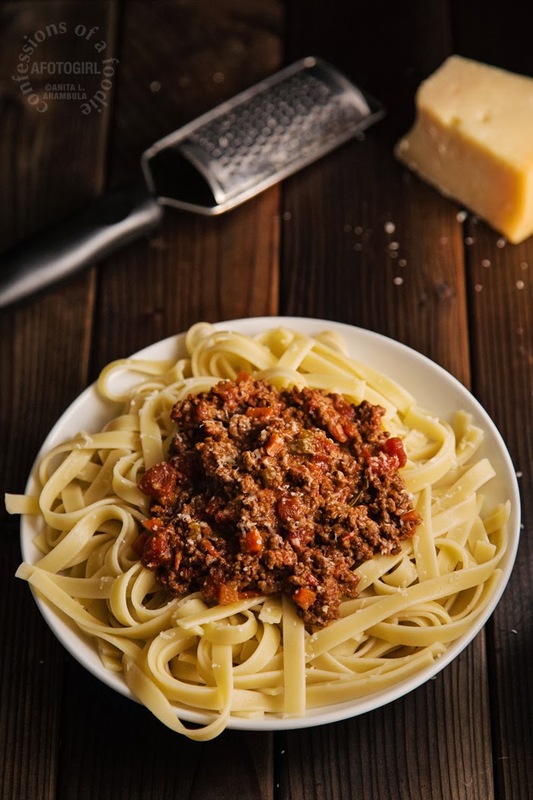 Drain pasta and toss it into the meat sauce along with the ½ cup of the grated cheese, stirring to coat well. Serve immediately, garnished with more freshly grated Parmesan cheese, if desired. Until next time … !Buen Provecho! P.S. You still have plenty of time to enter our OXO 5-Pound Food Scale Giveaway (a $30 value!). Click here to enter. Oh, this looks so delicious! I could probably have it for dinner every night and not get tired of it!